Stunt Casting In Science Fiction: Does Anybody Care? 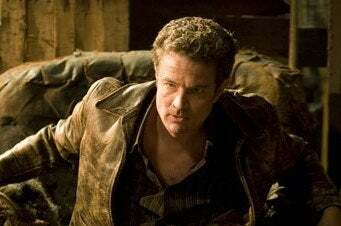 Here's your first official look at James Marsters in Caprica, and he looks... well, just like James Marsters always does. (Full image at EW.) Does anybody still care about science-fiction stunt casting at this point? I feel much the same about other Whedon Repertory Company actors, to be honest — if Amy Acker or Summer Glau turn up on Caprica, I'd have a vague sense of "Oh, good to see them again," followed by a measure of apathy. And ditto for former stars of the various Stargates and Star Treks. It just seems to be the way of things in television (and to some extent movie) science fiction: The same actors turn up in a lot of things, and some of them are more welcome than others. But once you've had one big role, it seems like people are going to offer you more things, and you'll play variations on the same character on different shows. It's not a bad thing at all, although it has a certain homogenizing effect after a while. Mostly, it adds to the feeling that there's a larger Rep Company in science fiction, beyond just the Whedon Rep Company — so it's like watching the Royal Science Fiction Company do another play together or something. Chuck really seems to thrive on casting Bruce Boxleitner, Scott Bakula, and now Brandon Routh and Kristin Kreuk, and Heroes has had everybody by this point. I get much more excited about stories — and especially the hint that a show is going to do something really original and interesting with artificial intelligence or alternate universes — than I do about an actor who was fun to watch in a different show turning up and hopefully being fun to watch again. I mean, I'll never say no to another snarky Mark Sheppard performance — you can just never have too many of those — but for the most part, when one of the "usual suspects" appears on screen, I'm just vaguely glad, not super excited.